MICHIGAN WORKERS UNITE AGAINST THE SNYDER-DILLON SHAKEDOWN! HANDS OFF OUR CITIES, COUNTIES, AND SCHOOLS! NO TO STATE-APPOINTED DICTATORS, PRIVATIZERS, TREASURY-LOOTERS, AND UNION-BUSTERS! NO MORE FUNDING CUTS TO CASH-STRAPPED CITIES, SCHOOLS, AND PUBLIC PROGRAMS! NO MORE CORPORATE TAX BREAKS OR FUNDING INCREASES FOR SKYROCKETING PRISON AND CORPORATE-WELFARE BUDGETS! NO MORE PUBLIC WORKER LAYOFFS OR CONCESSION DEMANDS! NO TAX HIKES FOR STATE PENSIONERS AND THE POOR! NO TO PUBLIC SECTOR UNION-BUSTING BILLS ACROSS OR BEYOND OUR STATE’S BORDERS! SOLIDARITY AND UNITY WITH WORKERS’ RESISTANCE TO LEGISLATIVE ATTACKS IN WISCONSIN, INDIANA, OHIO, AND OTHER STATES THROUGHOUT THE U.S.! The Socialist Party of Michigan stands in wholehearted solidarity with the growing resurgence of labor-resistance to the recently escalated round of class warfare legislation first introduced in the Midwestern “rustbelt” states of Wisconsin, Michigan, Indiana, and Ohio, and now rapidly expanding throughout the nation. Accordingly, the SPMI affirms its unwavering alliance with all forces seeking to further advance the growing wave of workers’ political protest and mobilization, toward an uncompromising demand for the working class’ collective seizure of political power. In convergence with the recent wave of legislative attacks on public workers’ collective bargaining rights sweeping over each of Michigan’s bordering states and beyond; recent counterpart legislation, drafted by Republican Governor Rick Snyder and Democratic State Treasurer (and 2007-10 Democratic State House Speaker) Andy Dillon, was successfully enacted by Michigan’s own corporate party lawmakers last month, to provide for not only the unchallengeable nullification of union contracts and bargaining rights of state employees, but also the most nominal political rights of Michigan voters residing in working class communities throughout the state. The “Local Government and School District Fiscal Accountability Act” (2011 Public Act 4) formally signed into law on March 16th, has since bestowed the state’s Governor and Treasurer with immediately effective authority to place any Michigan city, township, village, or school district into receivership status upon such officials’ allegedly perceived indication of even the most fleeting budgetary shortfall or tentative future deficit, thereby resulting in the State Treasurer’s or Governor’s assignment of an emergency financial manager (“EFM”) to assume absolute political and financial control over all aspects of that municipality’s or school district’s governance, operations, budget, and property; including expendable and transferrable control over the entirety of its community-owned public assets. While Michigan’s precedingly enacted “Local Government Fiscal Responsibility Act of 1990,” stopped short of furnishing the Governor’s appointed EFM’s to usurp full political control over a municipality’s or school district’s political or academic operations, Michigan’s newly enacted receivership law directly empowers an EFM to individually assume, exercise, override, appointively transfer, or otherwise suspend the powers of any and all locally elected bodies and officials at his/her own unmediated discretion, as well as to disincorporate, dissolve, or merge state municipalities; close an unlimited number of district schools; privatize municipal or school district services; and freely lock local elected officials and employees out of their own government offices, email accounts, and public information systems. As a further means of preemptively curtailing the capacity of the Detroit School Board, or any other receivership-subjected local body, to attempt to mount any more future judicial challenges to the dictums and encroachments of their state-appointed EFM’s, Michigan’s new receivership law additionally establishes strict new limits on the court’s jurisdiction to review EFM decrees, while further compelling the local government seeking judicial relief to bear all of the State Attorney General’s legal expenses for defending the appointed EFM against the local government’s own legal claims. In adding even further insult to injury, the newly effective legislation also provides no limit on the length of time during which a municipality or school district can be placed in EFM-subordinate receivership, while nevertheless requiring any municipality or district faced with such a status to bear the entire cost of financing, not only the full salary of its appointed EFM, but also the costs and salaries of any unlimited number of financial management assistant staff, or outside consulting, collection, and accounting firms that its commanding EFM may independently choose to hire. The consequences of such an arrangement have been particularly devastating to the Detroit Public Schools (“DPS”) district over the course of the past two years under the reign of its Granholm-appointed EFM Robert Bobb, during which his astronomical expenditures on private consultants, and apparent penchant for six-figure-per-month travel expenses, have resulted in the near doubling of the district’s deficit since the time he assumed full control over the district’s financial operations. In spite of such exacerbation of the district’s financial woes, Bobb has simultaneously ordered the lay-offs of hundreds of DPS workers, including the outsourcing of the district’s custodial and security staff to private corporations, and the closure of approximately 60 district schools, all while receiving a supplementary salary from the billionaire-directed and pro-education privatization Broad Foundation and Kellogg Foundation, in addition to the $280,000 personal salary (not counting the numerous other six-figure salaries owed by DPS for each of Bobb’s EFM-hired “consultant” staff) that DPS is compelled to pay annually to Robert Bobb alone. As with the counterpart legislation confronting workers in Wisconsin, Michigan’s newly enacted receivership legislation is equally, if only more insidiously, directed toward the same political effort to strip away the right, or otherwise meaningful ability, of public workers to engage in collective bargaining. Michigan’s new receivership law additionally grants automatic authority to an appointed EFM to act as the sole agent in collective bargaining with employees of a local government facing receivership, and to “reject, modify, or terminate” the terms of any existing labor contract or collective bargaining agreement at will. Furthermore, the new Michigan law exempts a local government from state collective bargaining requirements for up to five years from the date its placed in receivership status (should it continue to be imposed for that long), while also prohibiting an elected local government from subsequently amending its outgoing EFM’s developed two year post-receivership budget (including all contractual and employment agreements) without approval from the State Treasurer, or from revising any order or ordinance implemented by its former EFM during its period of receivership before to the passage of a full year after the date on which its status of receivership is terminated. Recent indications made by Michigan’s new Wall Street CEO-Governor have left little question regarding the extent to which the state’s current leadership aims to use the new receivership law as a mechanism to impose economic austerity measures within working class and oppressed communities throughout the state. As reported in the Detroit Free Press more than a month before the legislation’s passage, Dillon had already begun the process of training forty-five new EFM’s during the month of February alone, in confident anticipation of the legislation’s forthcoming enactment. As still yet another apparent means of further assuring the state’s widespread application of the new receivership provisions (or even the weight of the threat thereof), as both an instrument of privatization and billy club to strike and threaten the state’s organized workforce; Snyder’s concurrently drafted state budget includes a proposed 33% cut to state revenue sharing to cities, villages, townships, and counties, as well as a $470-per-pupil cut in state revenue to Michigan’s school districts. In direct contextual reference to such local revenue sharing cuts, Snyder himself was bluntly quoted in the February 18th edition of the Detroit News as noting that “there could be a number’ of cities that require an emergency financial manager in the coming months as a result of economic conditions.” Correspondingly, while the drastic state budgetary cuts to local government revenue sharing may serve to ensure that the state’s intensified receivership program obtains a wider application; the state’s corresponding ability to appoint an official with the power to unilaterally amend, eliminate, or renegotiate virtually any given state employees’ collective bargaining agreement at any time would serve to present the state with a much more readily attainable means to force such pre-budgeted public employee concessions to come to fruition. In addition to the ominously unexplicated concessions commitment and major cuts to municipality and school district funding, Snyder’s FY 2012 budget also includes pending legislative proposals to: (a) eliminate the state-income tax exemption for both public and private pensions; (b) eliminate the state; Earned Income Tax Credit and state Home Heating Credit for low income families, and reduce the Homestead Property Tax Credit for elderly and disabled state residents; (c) impose a 48 month life-time limit on welfare recipients with limited potential exceptions; (d) impose a 15% cut in funding to the state’s fifteen public universities; (e)eliminate 300 fieldworker jobs within the Department of Human Services; (f) impose a $2.3 million (9.4% ) cut in state aid to local libraries; (g) impose a $45 million cut to the Michigan Department of Community Health and the bouncing of 200,000 Michigan dually-eligible Medicare/Medicaid recipients into HMO-modeled programs; (i) privatize the dairy farm milk safety inspection process under the control of dairy industry representatives themselves; (j) eliminate Department of Agriculture inspections of animal shelters; and (i) expand low-wage privatization of services within state prisons and state veterans’ homes. When looking upon the already skyrocketing budgets of the state’s suppressive and corporate welfare apparatuses, however, Snyder’s ardent insistence on the need for “shared sacrifice,” appears, like the many similar appeals made by his Democratic predecessor throughout her last term, to entirely exempt such components of the state budget from its applicable scope. Despite already surpassing the state’s educational budget, even without Snyder’s most recently proposed school district and university cuts, Snyder not only refrains from proposing any corresponding cut to the Michigan’s obscenely soaring prison system expenditures, but actually recommends further increasing the Department of Corrections’ appropriations by nearly five million more dollars for FY 2012, followed by a second raise to the Department of Corrections budget by nearly eighty-two million more dollars for FY 2013. 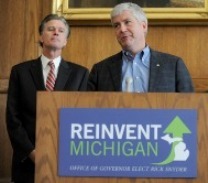 A similar examination of Snyder’s Executive Budget Recommendation for the Michigan Strategic Fund (MSF) correspondingly reveals no deviation from the enduring bi-partisan consensus on its seemingly sacrosanct status. While the Department of Corrections appropriations serve a latent corporate welfare function for the many profiteers of Michigan’s unceasingly nurtured prison-industrial complex, the MSF’s orientation to that function is entirely manifest. While constituting a state appointed public body composed of a handful of big business executives and several select state bureaucrats, the MSF operates almost exclusively as a legal intermediary to transfer state treasury money to the Michigan Economic Development Corporation (MEDC) – a cabal of corporate gangsters from each of the most Michigan-invested Wall Street firms, who thereupon function to grant out such public money directly to corporations throughout the state, as a form of dividend return on their sponsorship of, and investment in, the electoral and political operations of the two big-business parties. Accordingly, Snyder quite evidently illustrated the true meaning of his calls for “shared sacrifice,” by recommending, within his presently pending state budget proposals, that Michigan workers share approximately four-hundred million tax dollars with the MSF’s corporate beneficiaries over the course of the next two years. Moreover, in further eliminating the state business tax liability for all non-‘Class-C’ stock issuing firms, Snyder’s overwhelming commitment to share such previously taxable income with the ‘business community’ stands resolute even in spite of the fact that the state’s resulting $1.8 billion dollar revenue loss substantially exceeds the total amount of the state’s entire current deficit altogether! Although Snyder, like Wisconsin Governor Scott Walker, happens to align with the Republican wing of the two capitalist parties, the growing movement of workers’ resistance to the recent wave of attacks we’ve been dealt could make no greater error than to accept the illusory claim that any official section of the Democratic Party could be trusted to genuinely and positively align its hopes or preferences with our present struggle’s continued expansion, persistence, or success. Whether one looks to State Treasurer Andy Dillon’s development and administration of the state’s new system of receivership and union-busting, the simultaneous legislative attacks on public worker bargaining rights and contracted benefits initiated by Democratic majority legislatures in Massachusetts and Connecticut, or the practically universal union concession fights waged by virtually every notable Michigan Democratic politician elected to chief executive political office in recent times, (e.g. former Governor Granholm, current Detroit Mayor Bing, or even Lansing Mayor and so-called labor-rights-champion Virg Bernero); the Democratic Party cannot honestly be said to characteristically and meaningfully demonstrate any greater degree of loyalty to the labor movement than its GOP counterpart, nor truly even any greater reticence toward browbeating and suppressing it when in political power. As leaders of both of our state’s corporate parties declare empty platitudes about a new era for the 21st Century, and bipartisan pathways toward the reinvention of our state, the Socialist Party of Michigan contrastingly stands committed to the principle that any such meaningful process of reinvention must begin with the working class’ united seizure of political power from our present corporate oligarchy, and its corresponding establishment of democratic ownership and control over our political system, economy, and workplaces, as the basic prerequisite for obtaining genuinely free and autonomous self-direction over our own daily lives. The Socialist Party of Michigan Platform outlines an extensive program, aimed at cooperatively developing a contemporary and real-world path and vision for a truly democratic workers’ state government, run by and for the state’s working majority, rather than its richest one-percent. Since the time of its initial adoption nearly a decade ago the contemporary version of the Socialist Party of Michigan Platform has also specifically called for the “abolition of the right of the state government to stage ‘takeovers’ of community institutions;” as well as calling for full employment with a minimum wage of at least $15 per hour; a steeply graduated state income and estate tax; abolition of regressive sales, sin, and property taxes; a 100% capital flight tax on corporations that attempt to cut labor costs by leaving the state; full funding for state and municipal services to meet the needs of Michigan’s workers and environment; an immediate end to all forms of corporate-welfare; and the placement of all major corporations under democratic collective ownership and workers’ self-management. The specific and simultaneous selection of the Midwestern historic-rustbelt states, as staging-grounds for the present wave of anti-labor attacks, should leave little doubt that real focal point of our ruling class politicians’ vision for the “reinvention” of Michigan, and “new era” for the wider U.S., principally centers upon the working class’ numerous historic gains during the past century, and their targeting for a sweeping reversal in the new one presently unfolding. If you agree that the present struggle to build a fundamentally new society for the future must go hand in hand with a steadfast defense of lasting gains won in all earlier historic labor and social struggles of the past, then we strongly encourage you to join the Socialist Party and help us win this fight! This entry was posted in Publications, Statements and tagged Activism, Lansing by SPMI. Bookmark the permalink.